You can choose between self-catering or our house-maid included in the price for lunch or dinner. Dinner. Tagfrischen fish and other food brings our housemaid with on request. The washing machine is in the lower deposit, where surfboards can be parked. Please keep sealed overnight. If you leave the house, please also closed for your own safety, the lower terrace door and the wooden doors. It is also necessary reinzuholen the Outdoor mats and pillows overnight. In the guest rooms above, hooks are attached for the mats. Sometimes a fisherman comes by with catch-fish for Tagine or for grilling. My two friends and I had a wonderful stay at Roman’s property on the outskirts of Taghazout. I wouldnt change a thing. The property was perfect for our purposes being a peaceful escape from crowded city life. Most of the day all that can be heard is the rolling tide from the Atlantic which the property looks directly out onto. I spent hours simply lounging on the terrace watching the waves. The property manager/ minder, Mohammad, was beyond helpful and an absolute pleasure to talk to, while lovely Fatima served up gorgeous Moroccan meals for us. For those keen explore beyond the house, it is only a 10-15 minute walk from the surfers hub where there are plenty of cafes, surf hires/ lessons and yoga classes to choose from. Literally on the high tide mark! Quirky Moroccan styled house nesseled into the rock platform right in front of Anchor Point break. Mohamed, his niece Zineb and Fatima couldn’t have been more helpful. They really went out of their way to make our stay as smooth as possible. Fatima’s cooking is completely delicious - she gives you the supermarket receipt & you reimburse her. Expect her to be there for at least 3 hrs. The house is hard to find with no distinguishable features eg address, property name. Being a cat and dog lover is a must. BYO toilet paper, soap etc..
Beautiful stay by the sea! This was a beautiful little home located on the sea. We thoroughly enjoyed our stay here and were made to feel very welcome. The hosts were lovely and very generous. It was simply beautiful and we would highly recommend this lovely place. We spent 10 days at Casa Mona and loved every moment. We couldn't have picked a nicer spot for our romantic getaway. The house is gorgeous and very spacious with all the amenities provided. Our only regret was that we only had Fatima make us one meal. Next time we plan to take more advantage of her delicious cooking! We were only about a 5 minute walk to town but felt very secluded so we could enjoy the peace and quiet. Our favorite parts of the day were spent on the beautiful terraces enjoying a cocktail and listening to the waves. I have raved about this vacation since I returned to the states. If you're looking for a beautiful location, close to stores and a city, rent Casa Mona. You will love it!! Thank you to Monika and Mohamed for being such kind, gracious hosts, to Fatima for the delicious meal and keeping the place so clean and Paola, the stray dog, who looked out for us. I can't wait to book a return trip next year!! We spend a fantastic week in this wonderful house. Trips to the mountain, surfing and visting the Souk in Agadir added to this special experience and I am very happy to have found this place where you feel so well taken care of. Pure pleasure !! By entering Casa Mona you can feel you're welcome. This house is build and decorated by people who want to give its visitors a home-feeling. Close to the cost you can enjoy sun, water and quietness. It lies a 20 minutes walk from Taghazout. A small village, but you can buy anything you need. and last but not least, everyday Fatima prepears a delicious Maroccan meal! 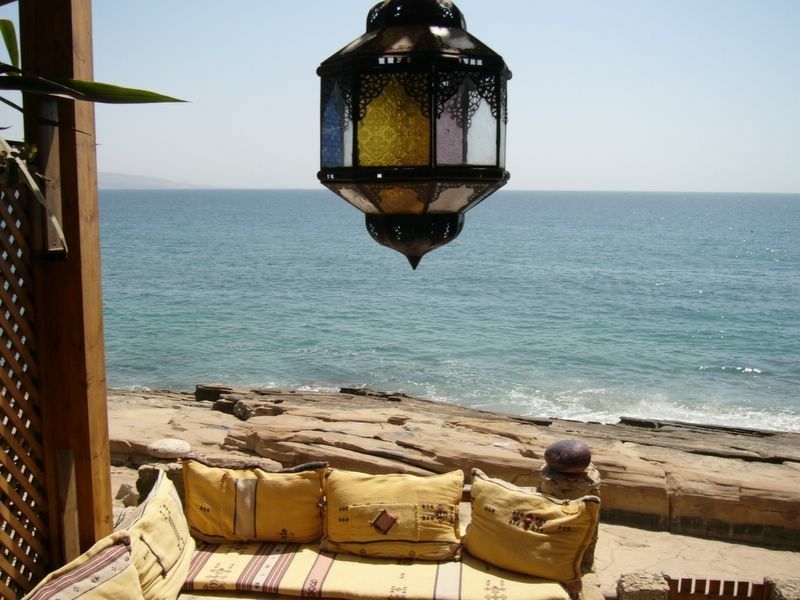 On the road to Essaouira, 20 km from Agadir, 10 minutes walk from the fishing village of Taghazout with kilometers of sandy beaches and cafes, Casa Mona is located in a quiet bay surrounded by a natural paradise. The distance to Agadir is about 15 minutes. From the house you have a view over the anti-atlas, the entire coast, Taghazout, Tamraght (to the palaces of the Saudis), Aourir to Anza near Agadir. Shopping possibilities can be found in Taghazoute, B. 'At Rashid'. You can buy alcohol at the epiceria in Agadir or at the shopping center Marjane. In Taghazout there are numerous small cafes offering simple food. If you want to enjoy a refined meal in a nice atmosphere, come back to Agadir on the beach promenade at the Cafe del Mar. The kitchen is very good and the service excellent. The French owner personally respects the quality of the food. Fresh baguette is served every morning. Golf: 4 golf courses in Agadir in about 15 minutes by car. The best golf course of Morocco (27 holes) is located in Ben Sergao (about 20 minutes from the house). Ski: Jet ski in Agadir-Plage, also for rent. Preise gelten bei Belegung bis 2 Personen für das ganze Haus. Jede weitere Person zahlt 100 Euro. Im Mietpreis enthalten sind ein Hausmädchen, das einkauft (Kosten für Lebensmitteleinkäufe nicht inklusive, bitte diese bei Fatima begleichen) und marokkanisch kocht. Strom und 1 Zisternenfüllung (4000 l) inklusive. Bei Mehrbelegung Preise auf Anfrage.